Hopefully, we've succeeded in these goals and you'll find poking around Pterosaur.net an enjoyable, interesting experience. We hope to continually modify the site to reflect the changing nature of pterosaur science and refine it for accessibility and readability. With that in mind, we welcome feedback and suggestions from our readers (contact us here). Before you start exploring the site further, though, we have one parting disclaimer: pterosaurs can be pretty controversial animals and opinions on most aspects of their palaeobiology are controversial. Hence, not everyone will agree with some opinions on our site. Heck, because different bits of this site were written by different researchers, not even all the authors of Pterosaur.net agree with on some details! We've tried to indicate where such controversies exist, however, but don't be surprised if other books, websites or documentaries present different opinions to those you find here. Pterosaurs are extinct flying reptiles. 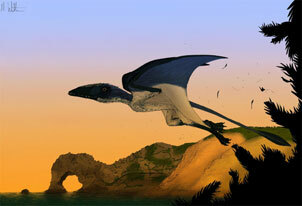 They lived worldwide in all kinds of environments and ranged from around 50 cm to 13 m in wingspan. They existed from about 225 to 65 million years ago and thus ran alongside the dinosaurs pretty much toe to toe for their entire existence, dying out in the great extinction at the end of the Cretaceous period. Although they first appeared in the Triassic period, their origins might extend beyond that by some margin, but fossils of this time are rare, so it is hard to say. Pterosaur fossils are rare (and the further you go back in time the more rare they become) and even more so than dinosaurs or even birds as their bones were hollow to reduce their weight. This makes them unsuitable for fossilisation and thus rarer than many of their contemporary relatives. Even so, we have thousands of specimens representing around 100 species (though this is still about 1/10th of the dinosaur fossil record). However many pterosaur fossils are from exceptionally well preserved fossil beds and thus are known with skin, beaks, claws, wings and other soft tissues preserved, and not just bones. Pterosaurs are not dinosaurs (or birds for that matter), but close relatives of them. Their exact origins are still uncertain (see the origins section) as pterosaurs are very advanced animals having specialised for flight and thus look quite different to their nearest relatives, making an exact comparison of anatomy very hard. They are certainly reptiles though, although you might not know that to look at a living one. Pterosaurs could fly. And fly properly (powered flight) not just gliding or soaring, but actively gain height when they wanted to on their own power and take off from the ground. To do this they had a large wing membrane stretched from an elongate finger on their hand that connected to their body. Accessory membranes were present in the crux of the arm and between the legs. Some also had a long tail with a small ‘tail vane’ flap on the end. Top: Pterodactylus, a pterodactyloid, and bottom: Preondactylus, a 'rhamphorhynchoid'. There are two major groups of pterosaurs—a scattering of early forms called ‘rhamphorhynchoids’ (the use of ‘’ is a taxonomic distinction unimportant here, but technically correct) and the more derived group the pterodactyloids, with a number of families in each group. 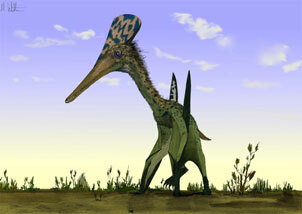 ‘Rhamphorhynchoids’ were generally small, had relatively broad wings, short necks, short and robust skulls, a large rear wing membrane, were poor on the ground, and had (with one exception), long tails. Pterodactyloids were generally the reverse—big, with, narrow wings, long necks, long skulls (often with no teeth), a smaller rear wing, were good on the ground, and had short tails. Crests of bone and skin were present in many taxa in both groups, though in general they are bigger and more elaborate in the pterodactyloids. While they overlapped in time and space, the pterodactyloids slowly took over as the ‘rhamphorhynchoids’ died out in the middle of their reign. In the air, pterosaurs were adept fliers and not clumsy gliders as once thought. The shapes of their skulls tell us about their brains and these are in some ways similar to other active fliers—birds and bats. Their wings were complex structures with many specialised layers of tissue that would have put them under the animal’s control and allowed them to perform well in the air. The additional membranes (especially the front one) controlled by a special bone called the pteroid would have helped with steering. On the ground the ‘rhamphorhynchoids’ were probably pretty poor. Their large rear membrane would have shackled their hindlegs together making walking difficult, and the shape of their hips and upper legs meant that could only really sprawl and not walk upright. Combining this information with the long claws on their feet and we can infer that they were probably far happier in the trees or on rock faces when not on the wing. The pterodactyloids had no such problems, as can be seen by their extensive fossil record of footprints. They had split their rear membrane in two freeing the legs which were brought under the body to allow them to walk far more effectively than their predecessors and helped them diversify to exploit new environments and foods (see the terrestrial locomotion section). There is unsurprisingly quite a bit of diversity in pterosaur morphology and ecology. There are great differences in size, their teeth and beaks, skull size and shape, neck length, wingspan and wingshape, leg length, foot size and more. This allows different animals to exploit different foods and environments from small woodland forms that caught insects in flight with snapping jaws, to flamingo-like filter feeders with thousands of teeth that live on lakes, blunt toothed clam crackers that patrolled coastlines, and huge tooth-less marine forms that hunted fish far out to sea. Soft tissue preserved in some fossils can tell us about beaks, wings, and more and most importantly pterosaurs were covered in a sort of reptilian ‘hair’ that made them furry (see the ecology section). At least some pterosaurs lived in large flocks and perhaps most did. At breeding times, some might have signalled their importance with their elaborate head crests or mating competitions in order to choose their mates. Eggs were probably laid a few at a time and buried in nests (we have three fossil eggs, each with a baby pterosaur inside). Growth was rapid and they probably reached adulthood in just a few years, even those that grew to prodigious sizes. The biggest pterosaurs were as much as 13 m across and weighed in at over 250 kg making them the biggest flying animals of all time. The age of the pterosaurs came to an end at the same time as the dinosaurs, and presumably the same series of events that affected their cousins were ultimately the cause of their demise. Pterosaurs were though the first vertebrate to achieve powered flight, they lasted for 150 million years and conquered every continent and habitat, not to mention producing species way beyond those of birds in terms of size. They were not ugly, scaled reptiles, poor gliders, simple animals that were out competed with birds (they survived a good 100 million years alongside their distant feathered relations), but fast skilful fliers, with a huge range of species, that were a diverse and important part of Mesozoic ecology for tens of millions of years.